The product and its ingredients have not been produced using the ecological method. 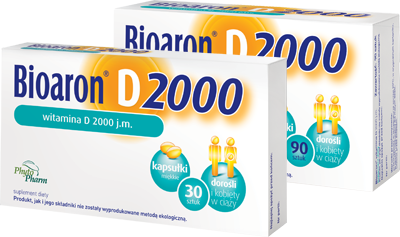 *Beneficial effects occur if 20 µg of vitamin D per day is consumed from all sources. Capsule contains: sunflower oil, vitamin D (cholecalciferol). Capsule shell ingredients: gelatine, humectant – glycerol. Do not use in case of hypersensitivity to any of the ingredients of the preparation. Do not take more than the Recommended Daily Intake. Do not use the dietary supplement as a substitute for a varied diet. Balanced diet and healthy lifestyle are fundamental to the proper function of the body. There are many risk factors for a fall resulting from instable posture and weak muscles and leading to bone fractures — change in one of those risk factors may or may not have a beneficial influence. Store in the original packaging in a dry place in a temperature below 25°C and keep out of reach of small children. Protect from light.